Take I90-94 to exit 87 at Wisconsin Dells. After you cross the Wisconsin River bridge, the first stop light is River Road. Turn left onto River Road. At the "Y" in the road, stay left. 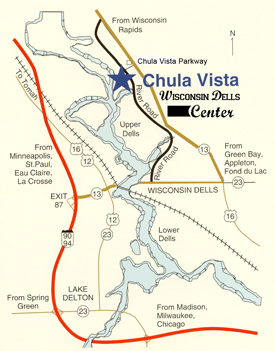 Chula Vista is 3 miles north on River Road. From the east, go to the intersections of Hwy's 16,23, and 13. Go north on 13 for 3 miles. Turn left at the Rest Area on Golden Avenue. Then turn onto River Road. Chula Vista's main entrance is on the right.